The Latin word for chalk is creta. Those familiar with the geological column and its evolutionary time-scale will recognize this as the name for one of its periods—the Cretaceous. Because most geologists believe in the geological evolution of the earth’s strata and features over millions of years, they have linked all these scattered chalk beds across the world into this so-called ‘chalk age’, that is, a supposedly great period of millions of years of chalk bed formation. Porous, relatively soft, fine-textured and somewhat friable, chalk normally is white and consists almost wholly of calcium carbonate as the common mineral calcite. It is thus a type of limestone, and a very pure one at that. The calcium carbonate content of French chalk varies between 90 and 98%, and the Kansas chalk is 88–98% calcium carbonate (average 94%).2 Under the microscope, chalk consists of the tiny shells (called tests) of countless billions of microorganisms composed of clear calcite set in a structureless matrix of fine-grained calcium carbonate (microcrystalline calcite). The two major microorganisms whose remains are thus fossilised in chalk are foraminifera and the spikes and cells of calcareous algæ known as coccoliths and rhabdoliths. How then does chalk form? Most geologists believe that ‘the present is the key to the past’ and so look to see where such microorganisms live today, and how and where their remains accumulate. The foraminifera found fossilised in chalk are of a type called the planktonic foraminifera, because they live floating in the upper 100–200 metres of the open seas. The brown algæ that produce tiny washer-shaped coccoliths are known as coccolithophores, and these also float in the upper section of the open seas. The oceans today cover almost 71% of the earth’s surface. About 20% of the oceans lie over the shallower continental margins, while the rest covers the deeper ocean floor, which is blanketed by a variety of sediments. Amongst these are what are known as oozes, so-called because more than 30% of the sediment consists of the shells of microorganisms such as foraminifera and coccolithophores.3 Indeed, about half of the deep ocean floor is covered by light-coloured calcareous (calcium carbonate-rich) ooze generally down to depths of 4,500–5,000 metres. Below these depths the calcium carbonate shells are dissolved. Even so, this still means that about one quarter of the surface of the earth is covered by these shell — rich deposits produced by these microscopic plants and animals living near the surface of the ocean. Geologists believe that these oozes form as a result of these microorganisms dying, with the calcium carbonate shells and coccoliths falling slowly down to accumulate on the ocean floor. It has been estimated that a large 150 micron (0.15mm or 0.006 inch) wide shell of a foraminifer may take as long as 10 days to sink to the bottom of the ocean, whereas smaller ones would probably take much longer. At the same time, many such shells may dissolve before they even reach the ocean floor. Nevertheless, it is via this slow accumulation of calcareous ooze on the deep ocean floor that geologists believe chalk beds originally formed. Now the chalk beds of southern England are estimated to be around 405 metres (about 1,329 feet) thick and are said to span the complete duration of the so-called Late Cretaceous geological period,6 estimated by evolutionists to account for between 30 and 35 million years of evolutionary time. A simple calculation reveals that the average rate of chalk accumulation therefore over this time period is between 1.16 and 1.35cm per l,000 years, right at the lower end of today’s accumulation rates quoted above. Thus the evolutionary geologists feel vindicated, and the critics insist that there is too much chalk to have been originally deposited as calcareous ooze by the Flood. Even creationist Glenn Morton has posed similar problems, suggesting that even though the Austin Chalk upon which the city of Dallas (Texas) is built is little more than several hundred feet (upwards of 100 metres) of dead microscopic animals, when all the other chalk beds around the world are also taken into account, the number of microorganisms involved could not possibly have all lived on the earth at the same time to thus be buried during the Flood.9 Furthermore, he insists that even apart from the organic problem, there is the quantity of carbon dioxide (CO2 ) necessary to have enabled the production of all the calcium carbonate by the microorganisms whose calcareous remains are now entombed in the chalk beds. Considering all the other limestones too, he says, there just couldn’t have been enough CO2 in the atmosphere at the time of the Flood to account for all these calcium carbonate deposits. 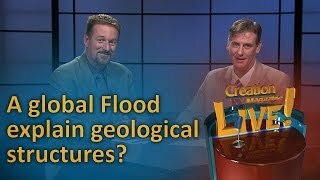 Two creationists have done much to provide a satisfactory response to these objections against Flood geology—geologists Dr Ariel Roth of the Geoscience Research Institute (Loma Linda, California) and John Woodmorappe. Both agree that biological productivity does not appear to be the limiting factor. Roth10 suggests that in the surface layers of the ocean these carbonate-secreting organisms at optimum production rates could produce all the calcareous ooze on the ocean floor today in probably less than 1,000 or 2,000 years. He argues that, if a high concentration of foraminifera of 100 per litre of ocean water were assumed,11 a doubling time of 3.65 days, and an average of 10,000 foraminifera per gram of carbonate,12 the top 200 metres of the ocean would produce 20 grams of calcium carbonate per square centimetre per year, or at an average sediment density of 2 grams per cubic centimetre, 100 metres in 1,000 years. Some of this calcium carbonate would be dissolved at depth so the time factor would probably need to be increased to compensate for this, but if there was increased carbonate input to the ocean waters from other sources then this would cancel out. Also, reproduction of foraminifera below the top 200 metres of ocean water would likewise tend to shorten the time required. Coccolithophores on the other hand reproduce faster than foraminifera and are amongst the fastest growing planktonic algæ,13 sometimes multiplying at the rate of 2.25 divisions per day. Roth suggests that if we assume an average coccolith has a volume of 22 x 10-12 cubic centimetres, an average weight of 60 x 10-12 grams per coccolith,14 20 coccoliths produced per coccolithophore, 13 x 106 coccolithophores per litre of ocean water,15 a dividing rate of two times per day and a density of 2 grams per cubic centimetre for the sediments produced, one gets a potential production rate of 54cm (over 21 inches) of calcium carbonate per year from the top 100 metres (305 feet) of the ocean. At this rate it is possible to produce an average 100 metre (305 feet) thickness of coccoliths as calcareous ooze on the ocean floor in less than 200 years. Again, other factors could be brought into the calculations to either lengthen or shorten the time, including dissolving of the carbonate, light reduction due to the heavy concentration of these microorganisms, and reproducing coccoliths below the top 100 metres of ocean surface, but the net result again is to essentially affirm the rate just calculated. Woodmorappe16 approached the matter in a different way. Assuming that all limestones in the Upper Cretaceous and Tertiary divisions of the geological column are all chalks, he found that these accounted for 17.5 million cubic kilometres of rock. (Of course, not all these limestones are chalks, but he used this figure to make the ‘problem’ more difficult, so as to get the most conservative calculation results.) Then using Roth’s calculation of a 100 metre thickness of coccoliths produced every 200 years, Woodmorappe found that one would only need 21.1 million square kilometres or 4.1% of the earth ’s surface to be coccolith-producing seas to supply the 17.5 million cubic kilometres of coccoliths in 1,600-1,700 years, that is, in the pre-Flood era. He also made further calculations by starting again from the basic parameters required, and found that he could reduce that figure to only 12.5 million square kilometres of ocean area or 2.5% of the earth’s surface to produce the necessary exaggerated estimate of 17.5 million cubic kilometres of coccoliths. As helpful as they are, these calculations overlook one major relevant issue — these chalk beds were deposited during the Flood. Creationist geologists may have different views as to where the pre-Flood/Flood boundary is in the geological record, but the majority would regard these Upper Cretaceous chalks as having been deposited very late in the Flood. That being the case, the coccoliths and foraminiferal shells that are now in the chalk beds would have to have been produced during the Flood itself, not in the 1,600–1,700 years of the pre-Flood era as calculated by Woodmorappe, for surely if there were that many around at the outset of the Flood these chalk beds should have been deposited sooner rather than later during the Flood event. Similarly, Roth’s calculations of the required quantities potentially being produced in up to 1,000 years may well show that the quantities of calcareous oozes on today’s ocean floors are easily producible in the time-span since the Flood, but these calculations are insufficient to show how these chalk beds could be produced during the Flood itself. Quite clearly, under cataclysmic Flood conditions, including torrential rain, sea turbulence, decaying fish and other organic matter, and the violent volcanic eruptions associated with the ‘fountains of the deep’, explosive blooms on a large and repetitive scale in the oceans are realistically conceivable, so that the production of the necessary quantities of calcareous ooze to produce the chalk beds in the geological record in a short space of time at the close of the Flood is also realistically conceivable. Violent volcanic eruptions would have produced copious quantities of dust and steam, and the possible different mix of gases than in the present atmosphere could have reduced ultraviolet radiation levels. However, in the closing stages of the Flood the clearing and settling of this debris would have allowed increasing levels of sunlight to penetrate to the oceans. The situation has been known where pollution in coastal areas has contributed to the explosive multiplication of microorganisms in the ocean waters to peak concentrations of more than 10 billion per litre.26 Woodmorappe has calculated that in chalk there could be as many as 3 x 1013 coccoliths per cubic metre if densely packed (which usually isn’t the case), yet in the known bloom just mentioned, 10 billion microorganisms per litre of ocean water equates to 1013 microorganisms per cubic metre. Adapting some of Woodmorappe’s calculations, if the 10% of the earth’s surface that now contains chalk beds was covered in water, as it still was near the end of the Flood, and if that water explosively bloomed with coccolithophores and foraminifera with up to 1013 microorganisms per cubic metre of water down to a depth of less than 500 metres from the surface, then it would have only taken two or three such blooms to produce the required quantity of microorganisms to be fossilised in the chalk beds. Lest it be argued that a concentration of 1013 microorganisms per cubic metre would extinguish all light within a few metres of the surface, it should be noted that phytoflagellates such as these are able to feed on bacteria, that is, planktonic species are capable of heterotrophism (they are ‘mixotrophic’).27 Such bacteria would have been in abundance, breaking down the masses of floating and submerged organic debris (dead fish, plants, animals, etc.) generated by the flood. Thus production of coccolithophores and foraminifera is not dependent on sunlight, the supply of organic material potentially supporting a dense concentration. Since, for example, in southern England there are three main chalk beds stacked on top of one another, then this scenario of three successive, explosive, massive blooms coincides with the rock record. Given that the turnover rate for coccoliths is up to two days,28 then these chalk beds could thus have been produced in as little as six days, totally conceivable within the time framework of the flood. What is certain, is that the right set of conditions necessary for such blooms to occur had to have coincided in full measure to have explosively generated such enormous blooms, but the evidence that it did happen is there for all to plainly see in these chalk beds in the geological record. Indeed, the purity of these thick chalk beds worldwide also testifies to their catastrophic deposition from enormous explosively generated blooms, since during protracted deposition over supposed millions of years it is straining credulity to expect that such purity would be maintained without contaminating events depositing other types of sediments. There are variations in consistency (see Appendix) but not purity. The only additional material in the chalk is fossils of macroscopic organisms such as ammonites and other molluscs, whose fossilisation also requires rapid burial because of their size (see Appendix). No doubt there are factors that need to be better quantified in such a series of calculations, but we are dealing with a cataclysmic Flood, the like of which has not been experienced since for us to study its processes. 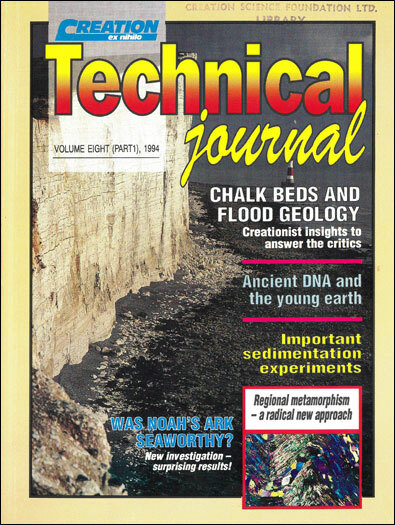 However, we do have the results of its passing in the rock record to study, and it is clear that by working from what is known to occur today, even if rare and catastrophic by today’s standards, we can realistically calculate production of these chalk beds within the time framework and cataclysmic activity of the Flood, and in so doing respond adequately to the objections and ‘problems’ raised by the critics. Wonderly thus sees this as evidence that Noah’s Flood could not have deposited these chalk beds, and that the rock record took millions of years to form. Scheven2 is equally familiar with ‘hardgrounds’ in his experience in the German Muschelkalk of the so-called Middle Triassic. In his Flood geology model, Scheven places these strata, and the English chalk beds, into the immediate post-Flood era, but in no way does he see any evidence in these rocks for the thousands of years that are so ‘obvious’ to Wonderly. Indeed, Scheven agrees that the chalk accumulated via mass propagations amidst mass extinctions and catastrophe. Furthermore, he describes the banding now observable in these chalk beds as due to transport and redeposition of calcareous ooze by water. But what of the borings and encrusted shells and tubes? These are not necessarily the conclusive ‘proof’ of thousands of years Wonderly insists they are. Molluscs, worms and other marine life were left outside the Ark, some to survive the Flood, in their marine ‘home’. Once the explosive blooms had generated the voluminous foraminiferal shells and coccoliths, these would then sink and be swept away by the Flood currents before being deposited in the alternating bands of the chalk beds. Other marine life would have been trapped by these surges and entombed alive, hence their presence in the chalk beds. In whatever moments they had before expiring, it is not inconceivable that some of these creatures would try to reestablish their living positions on whatever momentary surfaces they found themselves on. Ed. Note: See also Dr Tas Walker’s answer to a critic, Are hardgrounds really a challenge to the global Flood? Wonderly, D., 1977. God’s Time-Records in Ancient Sediments, Crystal Press, Flint, Michigan, pp. 130–131. Scheven, J., 1990. The Flood/post-Flood boundary in the fossil record. Proceedings of the Second International Conference on Creationism, R.E. Walsh and C.L. Brooks (eds), Creation Science Fellowship, Pittsburgh, Pennsylvania, Vol. 2, pp. 247–266. Pettijohn, F.J., 1957. Sedimentary Rocks, Harper and Row, New York, pp.400–401. Return to text. Pettijohn, Ref. 1. Return to text. Encyclopædia Britannica, 15th edition, 1992, 25:176–178. Return to text. Encyclopædia Britannica, Ref. 3. Return to text. Kukal, Z., 1990. The rate of geological processes Earth Science Reviews, 28:1–284 (pp. 109–117). Return to text. House, M., 1989. Geology of the Dorset Coast, Geologists’ Association Guide, The Geologists’ Association, London, pp. 4–10. Return to text. Schadewald, R.J., 1982. 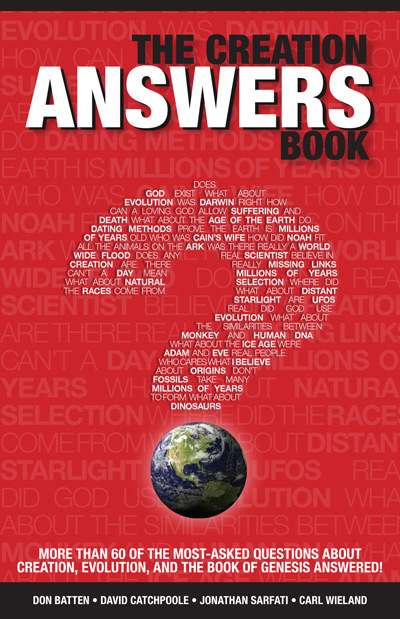 Six ‘Flood’ arguments creationists can’t answer. Creation/Evolution IV:12–17 (p. 13). Return to text. Hayward, A., 1987. Creation and Evolution: The Facts and the Fallacies, Triangle (SPCK), London, pp. 91–93. Return to text. Morton, G.R., 1984. The carbon problem. Creation Research Society Quarterly 20(4):212–219 (pp. 217–218). Return to text. Roth, A.A., 1985. Are millions of years required to produce biogenic sediments in the deep ocean? Origins 12(1):48–56. Return to text. Berger, W.H., 1969. Ecologic pattern of living planktonic foraminifera. Deep-Sea Research 16:1–24. Return to text. Berger, W.H., 1976. Biogenous deep sea sediments: production, preservation and interpretation. In: Chemical Oceanography, J. P. Riley and R. Chester (eds), 2nd edition, Academic Press, New York, Vol. 5, pp. 265–388. Return to text. Pasche, E., 1968. Biology and physiology of coccolithophorids. Annual Review of Microbiology 22:71–86. Return to text. Honjo, S., 1976. Coccoliths: production, transportation and sedimentation. Marine Micropaleontology 1:65–79; and personal communication to A.A. Roth. Return to text. Black, M. and Bukry, D., 1979. Coccoliths. In: The Encyclopedia of Paleontology, R. W. Fairbridge and D. Jablonski (eds), Encyclopedia of Earth Sciences, Dowden. Hutchinson and Ross, Stroudsberg, Pennsylvania, 7:194–199. Return to text. Woodmorappe, J., 1986. The antediluvian biosphere and its capability of supplying the entire fossil record. Proceedings of the First International Conference on Creationism, R. E. Walsh, C.L. Brooks and R.S. Crowell (eds), Creation Science Fellowship, Pittsburgh, Pennsylvania, Vol. 2, pp. 205–218. Return to text. Sumich, J.L., 1976. Biology of Marine Life, William C. Brown. Iowa, pp. 118, 167. Return to text. Seliger, H.H., Carpenter, J.H., Loftus, M. and McElroy, W.D., 1970. Mechanisms for the accumulation or high concentrations of dinoflagellates in a bioluminescent bay. Limnology and Oceanography 15:234–245. Return to text. Pingree, R.D., Holligan, P.M. and Head, R.N., 1977. Survival of dinoflagellate blooms in the western English Channel. Nature 265:266–269. Return to text. Wilson, W.B. and Collier, A., 1955. Preliminary notes on the culturing of Gymnodinium brevis Davis. Science 121:394–395. Return to text. Ballantine, D. and Abbott,B. C., 1957. Toxic marine flagellates; their occurrence and physiological effects on animals. 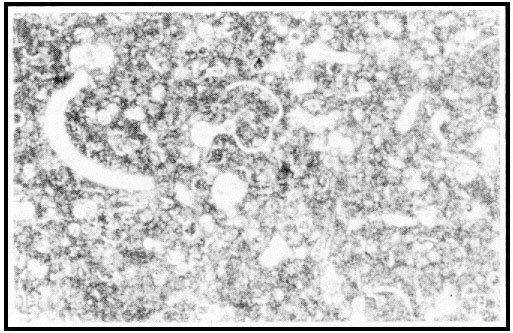 Journal of General Microbiology 16:274–281. Return to text. Tappan, H., 1982. Extinction or survival: selectivity and causes of Phanerozoic crises. Geological Society of America, Special Paper 190, p. 270. Return to text. Worrest, R.C., 1983. Impact of solar ultraviolet-B radiation (290–320nm) upon marine microalgæ. Physiologica Plantarum 58(3):432. Return to text. Vardiman, L., 1994. Ocean Sediments and the Age of the Earth, Institute for Creation Research, El Cajon, California (in preparation). Return to text. Leavitt, S.W., 1982. Annual volcanic carbon dioxide emission: an estimate from eruption chronologies. Environmental Geology, 4:15–21. Return to text. Roth, Ref. 10, p. 54. Return to text. Encyclop&ælig;dia Britannica, 15th edition, 1992, 26:283. Return to text. Sumich, Ref. 17. Return to text.